Jason Aldean celebrated not one, but two No. 1 singles yesterday (March 5). 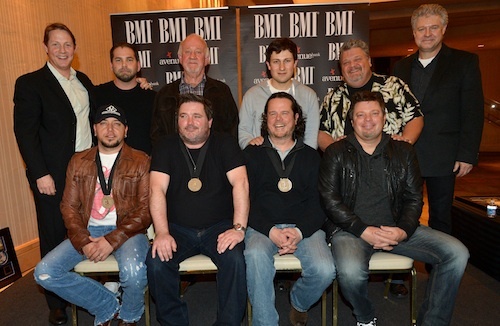 First, a crowd of industry members gathered at BMI‘s Nashville office to celebrate “Take A Little Ride.” Accepting honors along with Aldean were the song’s co-writers, Dylan Altman, Rodney Clawson and Jim McCormick. In addition, producer Michael Knox, Broken Bow Records’ Benny Brown, Big Red Toe Music’s Craig Wiseman and Cal IV’s Daniel Hill were part of the commemoration, along with a throng of industry well-wishers. 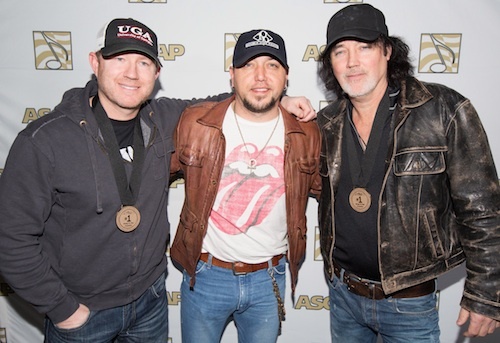 From there, Aldean headed to ASCAP‘s Nashville office to celebrate the hit “The Only Way I Know” (featuring Luke Bryan and Eric Church). The song’s co-writers David Lee Murphy and Ben Hayslip were on hand for the celebration. Producer Knox, along with representatives of This Music, N2D Publishing Company, and Warner/Chappell were on hand to celebrate. 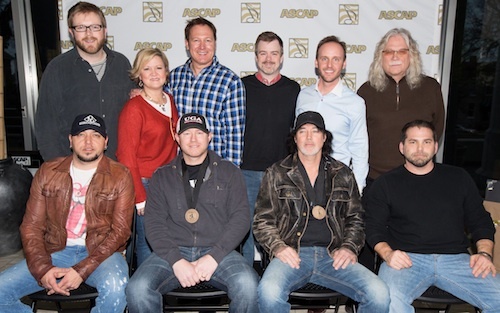 Pictured (L-R), front row: Jason Aldean, Ben Hayslip, David Lee Murphy and Michael Knox. Back row (L-R): Warner Chappell’s B.J. Hill, This Music’s Connie Harrington and Tim Nichols, Warner Chappell’s Ben Vaughn, This Music’s Rusty Gaston and N2D Publishing’s Douglas Casmus. Photo: Ed Rode. Pictured (L-R): Ben Hayslip, Jason Aldean, David Lee Murphy. Photo: Ed Rode.